What traits one needs to posses in order to be considered a hero? I guess courage and sympathy would be among the most important ones. This is a story of a real life hero from Bangkok who never hesitated whether to enter the canal with polluted water in order to save a life. He believed the life of the stranded kitten was worth saving, even if that meant risking his own. 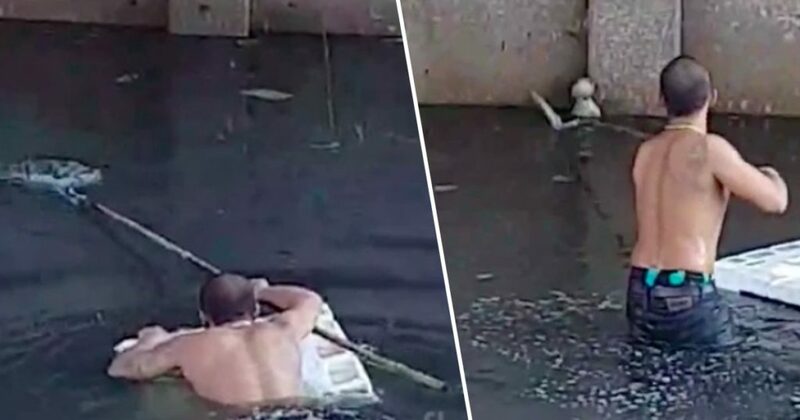 The man, although not that good at swimming, decided to do anything in his power to give this scared little soul a second chance to live. He used a polystyrene box as a float to negotiate the deepest part of the water. This incident that took place on 27 September was spotted by many onlookers who decided to film it and share it online, so that everyone out there could witness how brave and kind-hearted this man was. The scene was described as those of the movies, because it’s not every day that we get to see a man risking his own life for the sake of the cat’s. Luckily, the man thought everything through and had a large net in his hand. He used that net to scoop up the kitten and managed to pass it to a man whose house was located backs onto the canal.